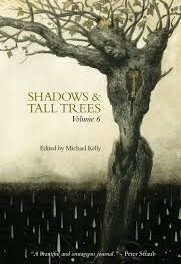 Previously a mix between a journal and a short story anthology, now simply an annual anthology, Shadows & Tall Trees ,under the expert editorial guide of Michael Kelly, continues to provide good, solid material to dark fiction fans. The current issue, graced by a splendid and disquieting picture cover by the artist Santiago Caruso, does include some truly excellent stories. My favourite is “It Flows From the Mouth” by Robert Shearman, a wonderful piece ,told in a terrific narrative style, about a strange friendship surviving beyond life, casting light on the little mysteries of our existence. Other noteworthy tales are the following. Kaaron Warren’s perceptive “Death’s Door Café”, depicts how doomed people can get their health back and a second chance in life by visiting a peculiar café, RB Russell’s “ Night Porter” is an intriguing and enticing supernatural mystery revolving around an odd lady with too many young male friends. In the “The Quiet Room” by VH Leslie a widower and his daughter move into a new house haunted by music and memories from the past . “Writings Fond In A Red Notebook” by David Surface is the distressing report of a nightmarish trip towards unspeakable, inhuman horrors while “Vrang” by CM Muller is a Kafkaesque, enigmatic piece about an unexpected inheritance literally set in the middle of nowhere. Finally, Ralph Robert Moore & Ray Cluley provide the excellent “The Space Between”, a very original tale portraying a man , relocated with his young wife under the roof of a humble building, who starts to spy on the other tenants’ lives and gets sucked in to an irreversible downward spiral.